Orchha fort complex has been captured in stone, frozen in time; a rich legacy to the ages. In this medieval city, the hand of time has rested lightly and the palaces and temples built by it's Bundela rulers in the 16th and 17th centuries retain much of their pristine perfection. 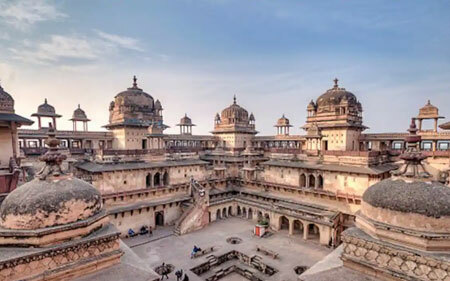 Orchha fort complex was founded in 16th century by the Bundela Rajput chieftain Rudra Pratap who chose this stretch of land along Betwa river as an ideal site for his capital. Of the succeeding rulers,the most notable was Raja Bir Singh who built the exquisite Jehangir Mahal, a tiered palace crowned with graceful Chhatries. From here there is a spectacular view of the soaring temple spires and cenotaphs. Complementing the beautiful proportions of the exterior are interiors which represent the finest flowering of the Bundela school of painting. In the Laxminarayan Temple, vibrant murals encompassing a variety of religious and secular themes, bring the walls and ceilings to life. Strewn around the area are little shrines and memorials, each with its own history which contributes to the nostalgic beauty of Orchha. Orchha fort complex houses three beautiful palaces set in an open quadrangle. These are Jehangir Mahal built by Raja Bir Singh in 17th century to commemorate the visit of Emperor Jehangir. It's strong lines are counterbalanced by delicate Chhatries and trellis work, conveying an effect of extraordinary richness. Raj Mahal - situated to the right of the quadrangle, is a palace built by Madhukar Shah, the deeply religious predecessor of Raj Bir Singh Ju Deo. The plain exteriors crowned by chhatries, that give way to interiors with exquisite murals, boldly colourful, on a variety of religious themes. Rai Praveen Mahal - Poetess and musician, Rai Praveen was the beautiful paramour of Raja Indramani (1672-76), and was sent to Delhi on the orders of Emperor Akbar, who was captivated by her. She so impressed the Emperor with her love for Indramani that he sent her back to Orchha. The palace built for her is a low two-storied brick structure, designed to match the height of the trees in the surroundings. Anand Mahal has beautifully landscaped gardens with octagonal flower beds and an elaborate water supply system. Skilfully carved niches allow light into the Mahal which has a main hall and smaller chambers.